Liquid Chlorine transfer is one of the most complex handling problems in the chemical industry today. At regular temperatures, chlorine is a gas possessing a strong aroma. When the gas is cooled at atmospheric pressure, it liquefies, forming clear, amber liquid. 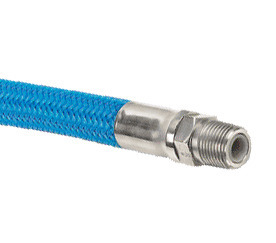 PTFE is the ideal transfer medium due to its unique properties; it is the only hose that can adequately transfer Chlorine in a safe manner. Pacific Hoseflex’s Chlorine transfer hose meets and exceeds the Chlorine Institute specification on operating and test qualifications. Pacific Hoseflex’s exclusive design resists the toughest handling and collapse. In addition, the low profile helical convolutions facilitate easy draining. Each assembly is marked and recorded for traceability.